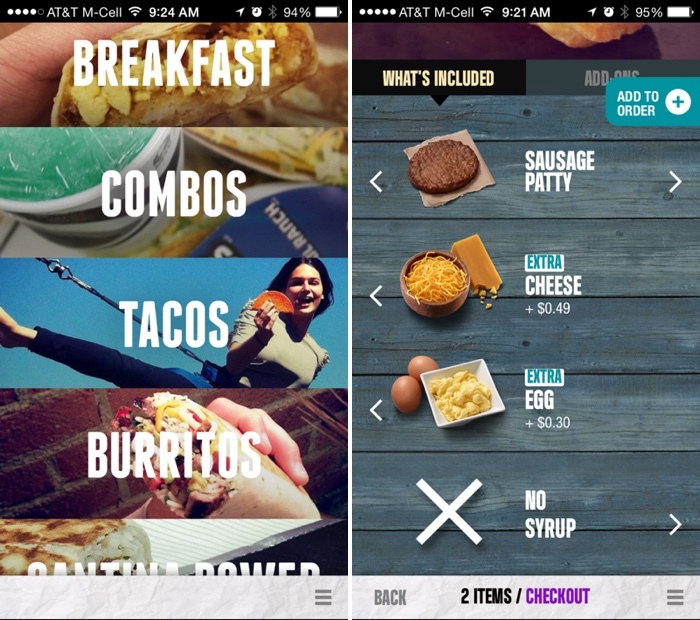 Taco Bell today launched a newly updated Live Mas Taco Bell mobile app that's designed to allow Taco Bell diners to place and customize their orders ahead of their arrival at the restaurant. After downloading the app, those seeking a Cheesy Gordita Crunch, Doritos Locos Tacos Supreme, or other food item from Taco Bell can tap log in or start a session as a guest. From there, tapping on the "Order" button will bring up a list of all the Taco Bell restaurants that are located nearby, and selecting one will bring up a store's individual menu. After selecting a location, scrolling downwards will provide a list of food options that have been organized into separate categories like Breakfast, Combos, Tacos, Burritos, and more. Taco Bell(R) Mobile Ordering is Here. Customize. Order. Pay. All from the new app. Now you can easily select a local Taco Bell, customize your favorite items and pay for your order. No need to select a pick-up time. We make your food when you arrive because just-prepared food is the best. Then skip the in-store line like you own the place. Plus, reordering your favorites is as easy as a twist of the wrist. Every food order contains customization options so that it can be prepared to a customer's specification. For example, with the Waffle, it comes with sausage, cheese, egg, and syrup, any of which can be removed. There's also an option to add extra of any ingredient, and there are options for add-ons like nacho cheese sauce, sour cream, onions, tomatoes, and more. While some options are free, many add an additional cost to an order. According to Taco Bell, while an order can be placed ahead of time, it is not cooked until a customer arrives at the restaurant they selected and checks in, at which point the employees begin preparing the meal to ensure freshness. Mobile orderers will not need to stand in the Taco Bell line upon arrival, and will be called up to the mobile counter when their meal is ready. Payments are made in the app with a credit card. The app has options to allow users to sign in to track their most recent orders, which makes re-ordering the same meal easy, and there are e-gift options that let customers send gift cards. Another helpful feature is the Nutritional Info, which lists the calorie content of all of Taco Bell's offerings. Taco Bell has been working on adding mobile ordering capabilities to its app for several months now, with the first news of an updated app coming back in February. At that time, Taco Bell's mobile lead Jeff Jenkins said that mobile is becoming increasingly important to quick service restaurants. "If you can get 10 million people to download your app, you're putting a portal to Taco Bell in 10 million pockets," he said. No Apple Pay? When I have the midnight munchies I won't be cognizant enough to do much more than scan my fingerprint. The app looks very nice though. How does this work with the drive through? When you are close to the store select Drive Through for your pickup method. When you get to the drive through tell them you have a mobile order. Pizza Hut has an app too - it doesn't look anywhere near this nice, but I love it because there's never any miscommunication about how I want my order done (plus skipping the line is nice). When will Yum (the company that owns Taco Bell and Pizza Hut) bring this to their other big chain, KFC? I personally don't care for Taco Bell, but KFC tastes pretty darn good. Only one KFC around here, and it's impossible to go back. The staff moves slower than the fried chicken. I think the chicken has better manners and is more likely to make eye contact. The Taco Bells and Pizza Huts have mostly shut down. I had forgotten that they all belong to the same parent company. Maybe it explains why they all went downhill in unison. Oh goody, just what I've always wanted. Seriously though, mobile ordering is so much better than other methods. There isn't so much of a language barrier (dialectical, background noise, and actual languages) as there is with over the phone or in person. It also probably saves the company a lot of time as the workers don't have to spend their day staring awkwardly into nothing while people decide as their ordering. Eventually they'll eliminate the staff and it will just be a big, walk-in vending machine. A truck will come every morning to top off the raw materials tanks. Another truck will come at night to haul away the garbage. They'll have a crew come in every day or two to hose down the furniture and the floors. Demolish and rebuild on a two-year rotation -- cheaper than cleaning out the stubborn grease in the nooks and crannies. Some customers will love the convenience, but I don't think it will be for me. Would have been awesome during college days! I downloaded the app, but I won't use it unless they add Apple Pay. I'm not really interested in adding my credit card to the app. These types of apps are the perfect example of how great Apple Pay is. Now you can simply add the ability to pay on an app without having to make people do all the setup process. In theory, if Taco Bell did this, you could link to Facebook and pay with Apple Pay and essentially be setup within a minute of downloading the app.